This is quick and easy, and very flavorful. The wasabi and ginger pack a real punch. First, the rice. Prepare whatever rice you like! I have served this with sticky rice, brown jasmine, and even over soba noodles, and they all were great sides. Mix the sauce ingredients and stir. Bring this to a boil in a small pan while you cook the fish, and let it simmer for a bit, then cover it and keep it warm. Cut the salmon into as many pieces as you have eaters, and sprinkle it with the salt and pepper. In a nonstick pan (I prefer a stir-fry pan), heat a little oil, and place the salmon in, skin side down to cook. Once the salmon is cooked about half-way through, turn it over and let it cook the rest of the way, until the flesh is brown on the outside, opaque in the center, and flakes easily with a fork. About 3-5 minutes on each side should do the trick. Peel the cucumber, and slice it in half lengthwise. Use a spoon to scoop out the seeded center on both halves, and slice it into small smiles (seeded half circles). Toss the cukes in a bowl with the mirin, rice wine vinegar, and a dash of sesame oil, and let marinate while the fish cooks. This is a nice refreshing side to balance the spice of the wasabi. 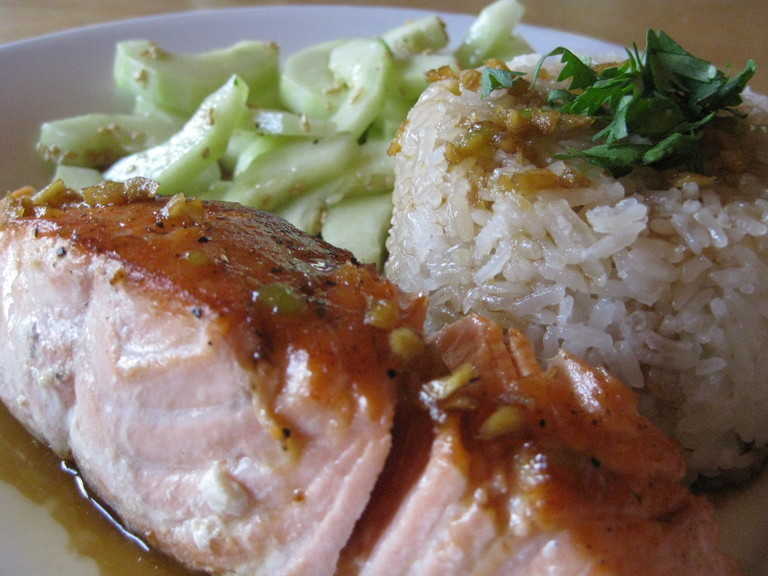 Once the fish is cooked, arrange your rice and fish on the plate, and drizzle the sauce over both. Enjoy!